If Amy Lee of Evanescence and Trent Reznor of Nine Inch Nails were fused together in some Sci-Fi accidental Star Trek like transporter incident, the result would be the birth of Klaryssa Korok, the heart and soul of Chamber of Echoes. Chamber of Echoes' sound embodies industrial influence with the essence of a powerful singer along with a gothic dose of musical melodies that make Chamber of Echoes a band to be reckoned with. During the late part of 2008 and the early part of 2009, Klaryssa worked side-by-side with the producers of Linken Park and Evenescence at NRG studios on her soon to be released EP, but Klaryssa didn’t see eye-to-eye with the famed record producer. 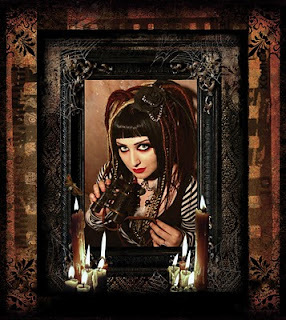 She eventually branched on her own to produce with Barret Sladle of ArtiSans Label to create an absolute, cutting edge industrial-goth double EP, “Unbound and Set Free” plus “Under Lock and Key”. Instead of changing her music into pop garbage, ArtiSans Label helped Klaryssa develop, Chamber Echoes into a perfected form of what she likes to describe are Ethereal goth and more of an experimental genre style of music, versus what NRG studies was trying to do with her music and remove her originality. I read that you had some troubles with the production of your album at the beginning of last year. Now, that you are back on track and you've finally produced two new EP's the way you intended it to be heard, are you happier with the final result? Of course I was! I was finally able to take the project into my own hands, and produce it myself the original way I intended. I didn't have someone leering over my shoulder telling me what I could and could not do with the music that I had written myself. With the NRG versions, all elements of the underground were stripped away, and I wasn't allowed to have control over what instrument I wanted in production, song structures, my original lyrics were mutilated, and I wasn't even allowed to have control over the sound and vibrato of my own voice. At ArtiSans Label, no restraints were placed upon me, and I was finally able to fully create what I had originally envisioned. Why do you think NRG Studios wanted to change your sound? They wanted to capitalize on the teen market, and thought that by watering down my music, and simplifying it in its entirety that younger audiences would be attracted to it, and it would draw a large amount of cash. They didn't understand that I was trying to create real art, and they were about hitmaker formulas that many major labels of the past use. They were all about the money, while I was about preserving my integrity as an artist. Since hooking up with ArtiSans, do you feel your integrity was preserved as an artist? Most definitely, and I sensed that from the first day that I ever met them. They were very encouraging, and pushed my creativity into new paths that were previously unknown to me. Never once did they mock my vision, or tell me no. 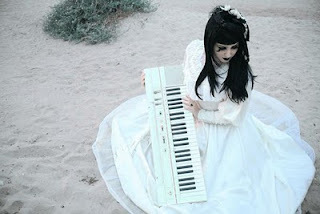 It is very seldom that a gothic-industrial artist can break into the mainstream, but after listening to your music, there is no reason why you couldn't be heard on the radio. Is your goal to be a mainstream artist, or do you prefer being on the indie scene? Or is it too early to say for sure? I never would want to be completely mainstream, and if I did, I would have been all about NRG's versions of my songs. I am always going to prefer the underground over mainstream, because in the underground there is so much room for experimentation, strangeness, eccentricity and room to grow in realms where mainstream music won't allow you to go. I prefer being a cross-over artist because while I like being an underground artist, I love to fuse traditional song structures and hooks in my music, and encourage the audience to be exposed to all underground elements of my songs. I want to create a sense of discovery in people, where when they hear my music, they can say out loud, "finally something different has come along". Well, I started singing when I was about 3, and at 7 and a half I started piano lessons. When did you start writing your songs? I remember the first instrumental song I ever wrote I was about 10,and then when I was about 11 I started writing songs with lyrics. What was that initial "push" that took you into making music? When I was younger, I always tried to write rock songs, but with an acoustic piano, and I could never do it the right way, I could never fully express the music I had inside of me with a solitary instrument. When I was in high school, I discovered Nine Inch Nails, and fell in love with Pretty Hate Machine. It was then that I discovered that there was only one person behind the whole project, and that Trent Reznor did pretty much everything himself, on keyboards. Then I thought, "hey why wouldn't I be able to do that?" I started teaching myself programming and engineering at 17, and aspired to be the female version of Trent Reznor, doing everything myself, but only on hardware and MIDI. Were any of your first works anything like your sound today? Some of the originality remains, such as ballad song structures, and acoustic piano, but not much more than that. I always tried to fuse traditional classical piano with drum machines, but I wasn't getting that point across with just those elements alone. I've come a long way from a rocky start. Where do you personally see your music career going? Right now, I've just released an album, and I hope to starting touring soon to promote it. In addition to that, I started my own record label, and hope to work with other artists as a producer and songwriter. Someday I also hope to compose music for video games and film soundtracks. I have a lot to do. About you music, what is the main theme? I would have to say the main theme of my music is vulnerability, but triumph over those setbacks as well. There are also elements of obsession, remorse, persuasion, self-sabotage, and longing. Who in your music are your major influences? Trent Reznor of Nine Inch Nails, for more reasons than I can ever explain, Depeche Mode, Evanescence ( for her vocal stylings ), KidneyThieves, Celldweller, Jakalope, and The Birthday Massacre. What is your favorite songs or songs, and why is it or are they so important to you? My favorite song would have to be "The Shade of my Spirit" for its meaning. Those are the most honest lyrics I have ever written, when I was at the all-time lowest point in myself. I feel that song above the rest captures sincerity and the pain I was going through like no other. Is your music a reflection of your personal life? It always is, and probably always will be. I can't write fake lyrics about something I've never experienced before, and I think the dishonestly would definitely show through. Though I hate downfalls, I find that they make me the most creatively expressive, and some of the best songs I have ever written have come from the darkest parts of my life. What message do you want your listeners to get from your music? To never be ashamed of their vulnerability, but to grow and create something great from personal setbacks and tragedy. Do you have any music videos in the works? I am currently talking to some video directors about the ideas I have, but nothing is yet set in stone. What is in store for Klaryssa and Chamber of Echoes? A concert tour to promote your double EP perhaps? Right now, it's all about promotion, and exposing the audience to my music through several live shows, mini-tours and social networking. I am always writing and producing new content no matter what, and currently am working on the visual portion of the live shows. There are still video projections to be produced, costumes to be made, instrument customization, merchandise to be designed and artwork to be created. I want to create a new movement in entertainment where the world has gone stale.